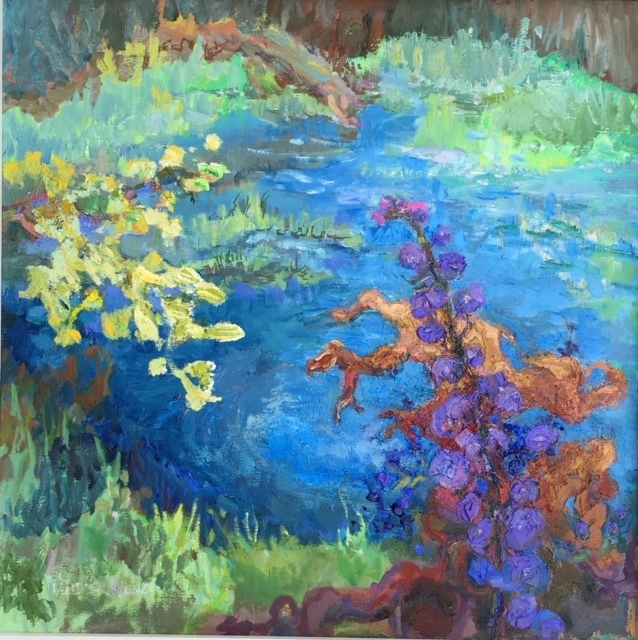 Resolution of "Ritner Creek with Larkspur" oil on canvas, 25" square. Too many subjects all fighting to dominate were the log in the background, the water, the sunlit willow leaves and the roots upended. The painting didn't give me a sense of wholeness and well being. Adding knock out willow leaves covering a larger area should be a happy change but it wasn't making my heart warmer. At times I thought I was pursuing the impossible resolution. Then in the foreground I wanted a joyful larkspur to contrast with the dead wood suggesting renewal. The violet of the added larkspur didn't show. I enlarged root in complementary colors but that did not pop the violet gray. I made the violet bigger and thicker. The root didn't move me. I kept working scraping away root color until I carved out the enlarged roots regaining the underlying layer tint of thalo blue. While I like the movement early on, I love getting the feeling of spring's renewal and life into this painting. Taking chances of spoiling what I liked about the painting, I made fearless changes that could make a difference in my eye and heart. Again I am trained to keep working - a painting lesson that I can apply to life. Clearly, this is harder work than I thought. Did you have the image fully in mind or did you just start with a section and get inspired? How do you keep the colors from getting muddy as you add new tones? Ok, enough questions. I do like the simpler one, but that is just me. Tabor, I started out with a blank canvas with my oil paints at Rain's ranch. As I set up Betty said, "Don't get too close to the edge of the bank because it is not stable and you could cave it in and fall into the creek. How about including the larkspur?" The safe place I slected was not close enough to the larkspur. My approach is to feel the linear movement and energy and second to decide what things fit into the energy. The water is the resting place and the energy was circular around it. I eliminated the larkspur because it was pointy and would cover the resting place in the center. As for keeping away from not getting muddy is a great topic for another post. Thank you for asking and go ahead and ask more questions so I will write posts that are of interest. Yes, the early rendition is not bad, Tabor. And exactly right you are. Which you prefer is a subjective choice. For me when it comes to expressiveness of the Olympian overview looking down into the cool water my heart is cooler. My heart is warmed not just by the life of the larkspur against the dead log and roots. The larkspur is painted from another view as though I was lying on the ground looking up.